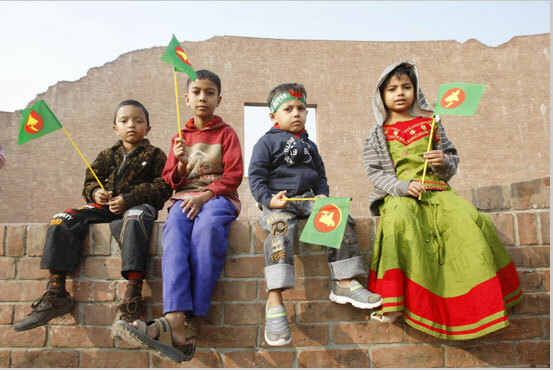 Bangladeshi children hold country's liberation war flags as they sits on a monument in honor of independence heroes in Dhaka, Bangladesh, Wednesday, December 14, 2011. Simultaneously, surrender documents were printed with the message of Sam Manekshaw and airdropped at various places in the East. I read later that the surrender documents were printed in the Statesman Press with the help of late Cushrow Irani, the editor of the paper. The message of Sam Manekshaw, particularly in Urdu, was broadcast over the All India Radio, both in the national and in the medium wave channels from Calcutta at intermittent intervals. The surrender documents were in the hands of Pakistani troops and soon we had information of response to those documents. This too was widely disseminated. Meanwhile, Eastern Command of the Army, led by Lt.-Gen J.S. Aurora and his Chief of Staff, Maj.-Gen (later Lt.-Gen) J .F. R. Jacob were in touch with Lt.General A.A. K. Niazi and finalized the details of the surrender. We were busy organizing the coverage of the events.